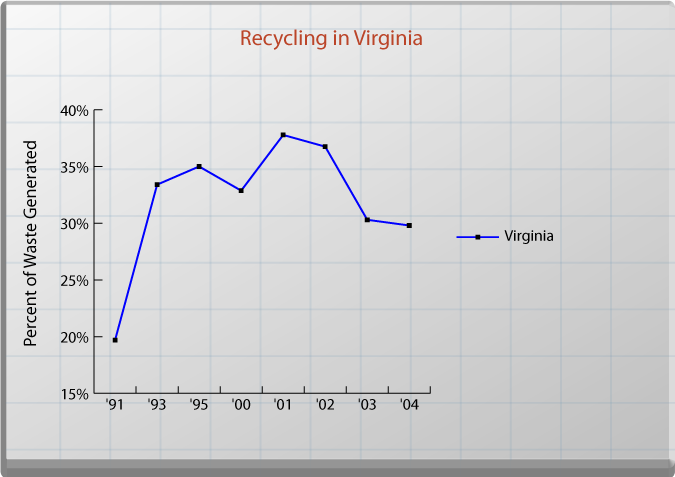 Virginia's solid waste stream has grown over time. Although potential landfill space is available in Virginia, the transportation and disposal of solid waste remain a concern. Landfills are associated with odors, risks to air and water quality, and increased traffic by heavy trucks loaded with landfill-bound waste. Unless properly constructed, maintained and monitored over a long period of time, landfills can leak highly contaminated leachate into the groundwater and emit numerous obnoxious and sometimes dangerous air pollutants. The availability of properly constructed and maintained landfills is an important public policy issue. To ensure the protection of the environment and of public health, proposed landfills are subject to significant licensing requirements, including site and design review by the Department of Environmental Quality. Expanding landfill capacity requires substantial startup time. Landfill standards differ for wastes according to the level of environmental hazard. 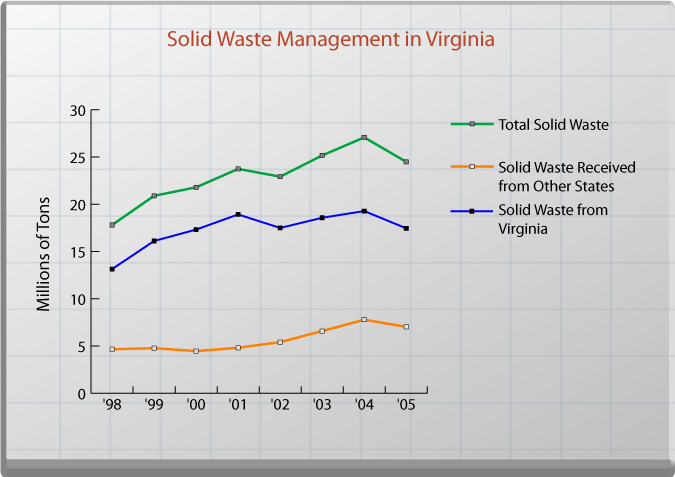 Virginia's solid waste stream has grown over time more or less in line with the growth in economic activity. Under the Commerce Clause of the U.S. Constitution, Virginia cannot prevent the importation of waste from other states for deposit in landfills within the state. The importation of waste has grown over recent years as northeastern states have found the cost of landfill space increasing rapidly, compared to the cost of transport to and disposal in Virginia. The statewide recycling rate has varied over recent years between 20 and 38 percent, and is currently at 30 percent. There is little state influence on the amount of waste deposited in landfills. Localities are responsible for determining the need for new landfill capacity and the use of their land. The Department of Environmental Quality is charged with regulating the management and disposal of waste. In this role, the department determines whether the new capacity approved by the localities is constructed and monitored in a manner protective of the environment; inspects landfills to ensure that their programs prevent unauthorized waste, such as hazardous waste, from entering the landfill; prescribes requirements that the owner must meet when the landfill is closed; and works with localities to promote recycling and to establish local programs. The state could evaluate economic incentives associated with recycling, waste generation and disposal. Information about waste disposal sites: The Virginia Department of Environmental Quality (DEQ) has launched a 5-Step Plan to help Virginia residents and local governments obtain information about sites that may have been used for waste disposal in the past. DEQ has assembled a web page for the 5-Step Plan (www.deq.virginia.gov/waste/ disposal.html) to assist localities in identifying known and/or potential past disposal sites that may be present in their region.